This is the sermon I preached last Sunday, Baptism of Our Lord, Jan. 13 at St. Timothy Lutheran Church. The gospel was Luke 3:15-17, 21-22. You are probably familiar with the TV show, “The Voice.,” Unknown amateur artists have the chance to wow the judges and viewers. The winner receives $100,000 and a recording contract. Even those that haven’t won have often gone on to have successful careers because of their exposure on the show. Listeners have heard some amazing voices and some not so amazing. In today’s gospel for the Baptism of Our Lord, author Luke spends little time writing about the actual baptism, but rather concentrates on the aftermath, speaking of yet another Voice, that of the Father. It is after Jesus’ baptism, while he was praying that the heavens opened and the Holy Spirit descended that things started to happen. The closing of heaven brought drought (Luke 4:25), while the opening of heaven would bring God’s blessings. God’s power and mercy were about to be unleashed. This signaled the launching of a new age. Jesus prayed a lot and this is emphasized in the Gospel of Luke. It was at critical moments such as after his baptism, choosing the twelve disciples, when asking the disciples to say who he is and when on the Mount of Transfiguration that we read of our Lord being in prayer. Luke emphasizes that it is Jesus’ praying that motivated the disciples to ask him to teach them to pray, which he does, giving them the Lord’s Prayer (11:1). We also find Jesus at prayer before his death and on the cross. The Holy Spirit descended in bodily form like a dove. I wonder why Luke makes a point about it being bodily? It may be so that Jesus’ experience would not be confused with thought or feeling alone. It was really real. Bodily descent also indicates permanence. The Spirit didn’t just descend upon Jesus one time, but came in bodily form and remained upon Jesus. God’s Holy Spirit does not make Jesus the Son of God but empowers God’s servant for his task. Second, the quality of this relationship is seen in the description of Jesus as the beloved Son. This may well be an emphasis on Jesus’ elect status referenced in Isaiah (41:8), highlighting that he is uniquely chosen for his task. Third, it is the Son with whom God is well pleased. This alludes to Isaiah as well (42:1) reading, “Here is my servant, whom I uphold, my chosen, in whom my soul delights; I have put my spirit upon him; he will bring forth justice to the nations.” As the Father’s Servant, Jesus carried out prophetic and representative roles. The voice affirms Jesus as Son, affirms Jesus as Beloved and affirms Jesus as one with whom the Father is pleased. The baptism may have been routine, but the aftermath was anything but. Why a divine voice? Above all, it provided an unimpeachable sanction of Jesus’ identity and mission as God’s agent of redemption. It accentuates Jesus’ role as God’s representative. Jesus’ mission and status are spelled out in relation to God referencing his purpose as expressed in scripture as God’s servant and son. Jesus certainly would need such assurance as he went about his work. Being the Son of God means facing temptation as we see in Luke chapter 4 and being servant to all in need. His was not a life of glory, but one that led to the cross. In baptism, we submit to God’s grace and find identity and affirmation. Prayer unlocks the power of our baptism. God has claimed us and established a relationship with us. Prayer is how we live into that relationship—how the heavens are opened to us. Our prayer is God’s presence moving through us. We can pray to our Abba, Daddy God because deep in our hearts we are connected—children and heirs to the reign of God. God urges us to pray and when we receptively respond, we become a channel of God’s saving power in the world. Like Jesus, in praying, we run the risk of being used by God to accomplish God’s will for creation. Jesus lived out his baptism every day as he taught us to feed the hungry, clothe the naked, care for the sick and dying and share the good news with a broken world. Does the voice of the Father at Jesus’ baptism say the same things to us at our baptism? It is through baptism that we become part of the family of faith. We too hear promises of God’s love for us and we too are called to the ministry of sharing that love. It is the impetus for our ministry as it was for our Lord’s. As Jesus was in prayer when the Holy Spirit descended, so we, just as the early church did, awaiting the promised power of the Spirit, should continue to be constant in prayer. There is no reason we should think that the Holy Spirit and prayer are simply part of history and not available for life and ministry today. As a people who bear the name of Christian, God calls us to live out our baptisms in the same way as Jesus did—caring for the needy and sharing the good news. Thus we must regard Baptism and make it profitable to ourselves, that when our sins and conscience oppress us, we strengthen ourselves and take comfort and say: Nevertheless I am baptized; but if I am baptized, it is promised me that I shall be saved and have eternal life, both in soul and body. Luther also admitted, “ I study [baptism] daily,.”… “In baptism, therefore, every Christian has enough to study and practice all his or her life. Christians always have enough to do to believe firmly what baptism promises and brings.” Baptism was a touchstone for Luther and can be for us as well. 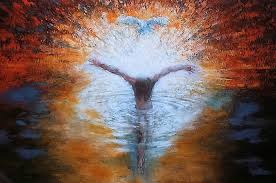 Baptism…is wholly God’s work that we may have confidence that no matter how often we fall short or fail, nothing that we do, or fail to do, can remove the identity that God conveys as a gift. Our relationship with God…is the one relationship in life we can’t screw up … because we did not establish it. This is why we can baptize babies, because the work is entirely God’s and dependent upon God, not us. Later when we share in holy communion, you will have the opportunity to physically remember your baptism. If you desire, you may dip your fingers into the water of the baptismal font before receiving communion. Are you longing to hear the Father’s voice, to hear God call you by name? It can be difficult to hear in our noisy, busy world. Perhaps we cannot hear God’s voice because we aren’t open to the frequency in which God chooses to call us. Perhaps our daily rush tunes out the heavenly summons, not taking the time to quiet ourselves, our minds, our inner voices. We can use this time in the season of Epiphany to clear out a corner of our lives for quiet prayer, meditation or centering prayer. In this season of epiphanies, today’s miraculous encounter with the living God immerses us in the sound of God’s voice and bathes us in God’s baptismal promise. All who are splashed by this water gasp, cry, exclaim and sing! (sundaysandseasons.com). We are empowered by God’s Spirit not only to become part of a movement but to invite others to join the movement of God, to work the signs of the realm of the kingdom of God and to embody the qualities of that realm in our life together.